Yelapa is not an island, but for most practical purposes, it’s accessible only by boat. 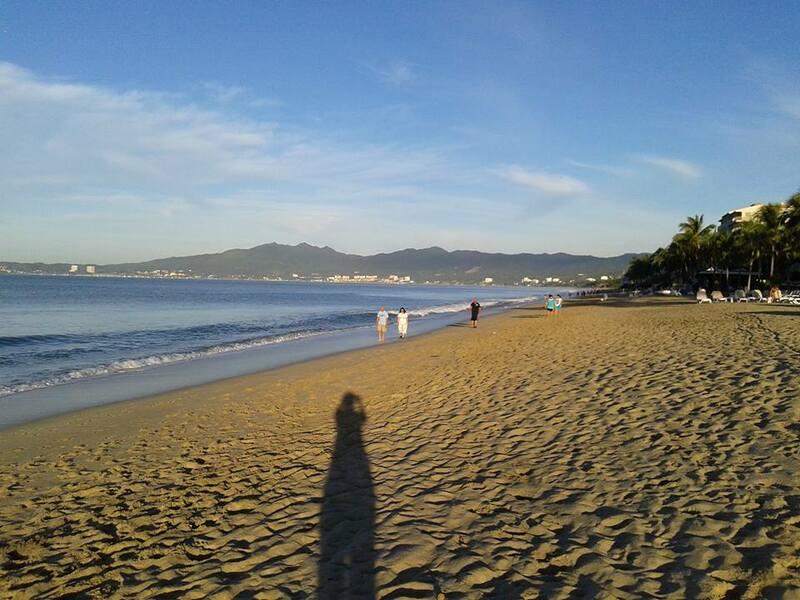 The first time that I went, I took a small water taxi from the Puerto Vallarta harbor. The other times, I chose to take excursions on more comfortable catamarans with Vallarta Adventures, which runs day trips starting in either Puerto Vallarta or Nuevo Vallarta. These trips include snorkeling and kayaking, a buffet lunch, and unlimited drinks, plus an optional hike through the village of Yelapa to a refreshing waterfall, and time to relax, swim, or eat some more at the Yelapa beach. There were weddings almost every night on the Bel Air beach at sunset. When I had enough snorkeling, I clambered back onto the boat only long enough to take off my snorkel gear and switch the life-vest from waistline to chest position. Then I spent some time kayaking around the area. The crew was amazingly helpful in making it possible to board the kayak from a platform off the back of our very bouncy catamaran. When I got back on the boat after kayaking, I felt hungry from the activity. The buffet lunch was ready and tempting. I filled a plate, but didn’t manage to eat much of it. My appetite quickly vanished as soon as I sat down and felt the continuous rocking of the boat. For the same reason, I couldn’t indulge in the free cocktails. I felt compelled to sip coca cola instead. Luckily, it was not much longer before the boat headed off again and we reached Yelapa. Yay!! I was very eager to step off onto the dock and hike up to the waterfall. The path passes through the small village which has multiple artisan stands selling typical Mexican crafts. If you want to get souvenirs, this is a convenient and inexpensive place to buy some. For me, standing under the cascading waterfall was the highlight of the trip. I particularly enjoyed that I got to experience this together with a daughter, who happened to be on a surfing vacation in nearby Punta Mita and came along for this day’s excursion. My daughter was actually the one who persuaded me to come join her under the waterfall despite my initial hesitation to enter the chilly water. Sometimes, it’s good to get a little prodding. We didn’t rush to get out of the water and were among the last ones in our group to meander back down the hillside and wend our way over to beach, itself. 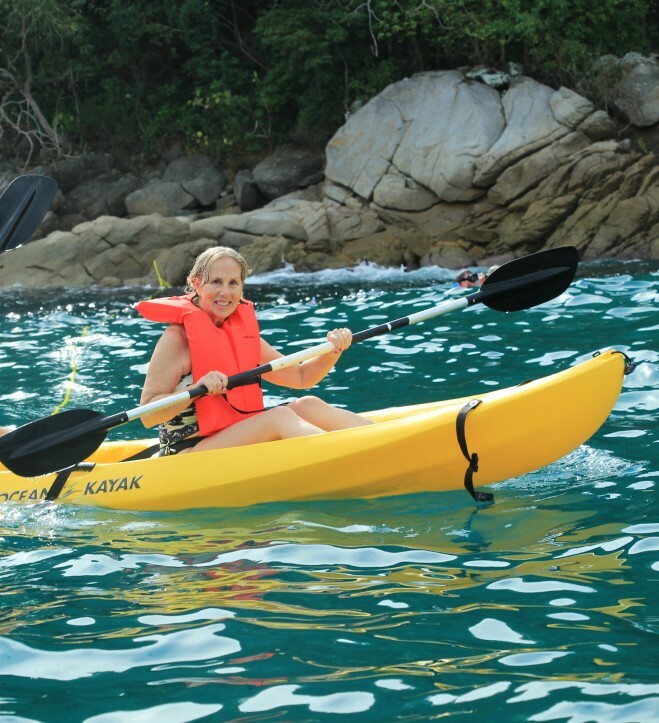 I strongly recommend Vallarta Adventures for excursions from Puerto Vallarta or Nuevo Vallarta. I have taken two excursions with them to Yelapa and another excursion (on a previous visit one year ago) called Marietas Eco Discovery. The best part of the Marietas tour, though, was swimming through a low ceiling grotto to the hidden beach. That part of the tour is dependent on the condition of the sea. When we went to the Marietas last May, the sea was calm enough for us to snorkel though the grotto to that hidden beach. It was amazing. I’ve stayed twice at Bel Air Hotel in Nuevo Vallarta. It’s a relatively small hotel with a minimal amount of scheduled activities (aqua exercise, volleyball, etc.) and its onsite restaurant is not very good. The rooms are large, but dated. But I like it enough to have returned for a second visit and I will probably come again. Why? Because it’s right on the beach and I get a room where I can see and hear the waves. 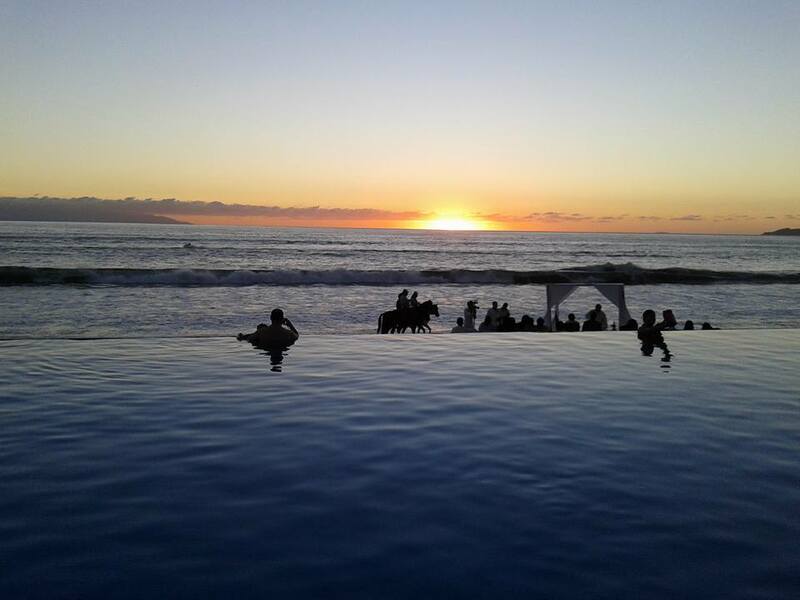 They have an infinity pool overlooking the beach and it’s a great spot to sit and watch the sunset. I also like the fact that many of the guests are Mexicans. But I also met a few American and Canadians who choose to come for extended periods of time—up to two months—because they feel comfortable at Bel Air and want to avoid the cold winter months back home. As I said, I wasn’t favorably impressed by the Bel Air restaurants. I do some of my own cooking in the kitchen that is included in my accommodations. I also ate a nice dinner at the El Patron restaurant belonging to the hotel that is immediately next door, Villa del Palmar San Lucas. For a really pleasant afternoon lunch, I would recommend taking a little longer taxi ride (30 minutes) to Punta Mita. They have several good restaurants along the beach and it’s worth the ride to get there. I’ve never been to this part of Mexico but your wonderful article makes me eager to go!! That’s great! You should try it sometime. It’s friendly, safe, and relatively inexpensive. You’ve piqued my interest. Sounds like a place worth investigating!